I find it highly amusing that having written about our balmy, autumn days in the last post, the temperatures have made a 40 degree drop. As I sit here on this brusque and frosty Sunday morning, sipping a cortado at my favourite coffee shop, the snow is falling; meandering and slicing through the icy air and disappearing as it hits the ground. It is early still and the snow flakes, though falling with a vengeance, are still too wet to accumulate. As the day goes on, accumulate it will, and then the desire for a crackling fire and thick, hearty food will set in. I am already dreaming. My husband has stated that he wants a stew like dinner with some chunky bread. I think a luscious and creamy chicken stew is on the menu for today. It may be quite monochromatic in many areas of the world right now; all the autumn and summer colours have vanished for the season. The twinkling and rainbow lights of the holiday season are what brighten up the neighbourhoods these days. They have their own festive beauty and I find them a welcome sight in the dreariness of winter. These pickled sweet beets from MM Local though, are colourful enough to brighten up your dullest winter day. Not only are they beautiful and full of vibrancy, their mild pickleness (okay, so that’s not a word, but it describes them perfectly), kick starts your taste buds that may have gone into hibernation for winter. They have a lovely sweet and mild pickle flavour which is not over powering but incredibly moreish. The wonderful folks at MM Local Foods provided me with some of their excellent preserved and pickled products. I made a Pear and Pomegranate Stuffing with some of their Paonia Pears with Rosemary for Thanksgiving. The second product I picked was their Holiday Beets, pickled beets with a bit of holiday spice. I have to admit, these were hard! It was hard trying to develop a recipe with pickled beets. 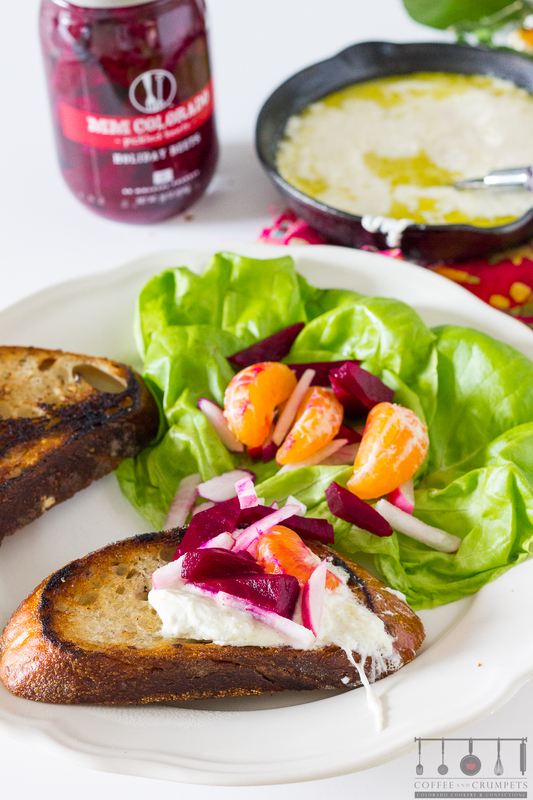 Most of the time, the pickled beets end up with cheese in a salad or are eaten straight from the jar. Honestly, I didn’t want to change them too much because they are delicious straight up. So, I did end up making a kind of a salad but it’s what you can do with the salad that’s pretty awesome. I have shared all the variations I tried, but I think there are few more ways you can use this Pickled Beets Slaw. The slaw doesn’t really need a recipe because you can add what you want with the beets and in the quantity you like. I chose to pair my pickled beets mainly with the great citrus that is in season right now. I added some radishes for crunch, you can use jicama if you can get a hold of some. I also added some beautiful, microgreens for colour and an understated salad flavour. I was going to use just straight up orange segments, but when I went shopping for my ingredients, Whole Foods had these irresistible leaf and stem satsumas. I made up my mind when I saw those piled up high in the front of the store. So, here’s a funny story about my trip to Whole Foods that day. This Whole Foods is a new one that just opened up 2 minutes from my house. I was so excited that I had to go on their opening day. As I am intently reading my grocery list and mentally picturing my recipe, and ideas are whirring away, I was approached by this young lady. She is the social media person for Whole Foods and she asked if I’d be okay with them taking a photo of me shopping. She asked about what I was purchasing and what I was going to be making. So, I told her I was a blogger and what I was working on, of course then, she got quite excited and long story, short, I ended up on their opening day album on Facebook. Now, when I go to Whole Foods, which I’ve gone to 4 times in the 5 days they’ve been open, I get the cashiers asking me if I’ve seen my photo. Ahhhh, fame, I’d better share my recipe before my head gets too big to type. The first way I used the slaw was to top a piece of perfectly, pan roasted salmon. The salmon is a nice, fatty fish which lends itself really well to slaw- like toppings, especially something a little acidic. 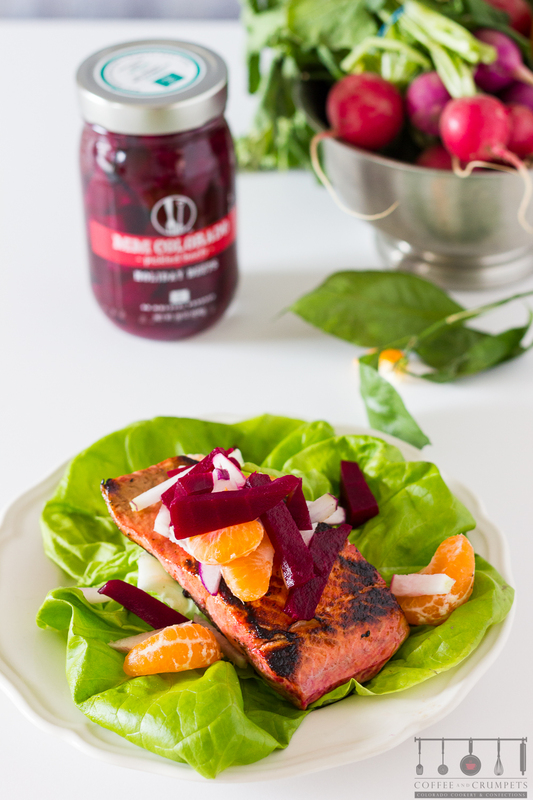 The beets and the satsumas really went perfectly with the salmon. 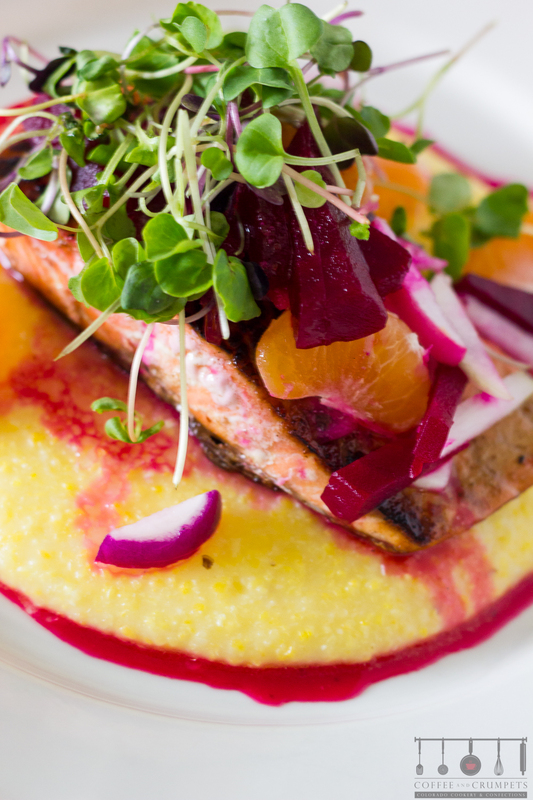 I put the salmon on a base of soft, buttery polenta and all the dressing drizzled through the slaw and soaked into the polenta. Absolutely delicious. The slaw topped salmon can also be served on a bed of lettuce or as the protein in a main salad. An appetiser using the slaw, is pairing it with a cheese, but not just any old cheese, roasted burrata cheese. If you haven’t had warm burrata, you are missing out! Roasting the burrata, of course, melts it, and then all that cream gushes out and mingles with the stringy, oozy, melty mozzarella. Scoop up this delicious and luscious bit of heaven with some grilled or fried, good artisanal bread and topped with a heaping spoonful of the beet slaw. As you can see, the photos show that I couldn’t keep my hands off the bread. I kept taking bites and the last few photos show just a mouthful. The flavour combination of the the pickled beets, the sweet satsumas and the mellow mozzarella is just an explosion of taste. How would you use this slaw? 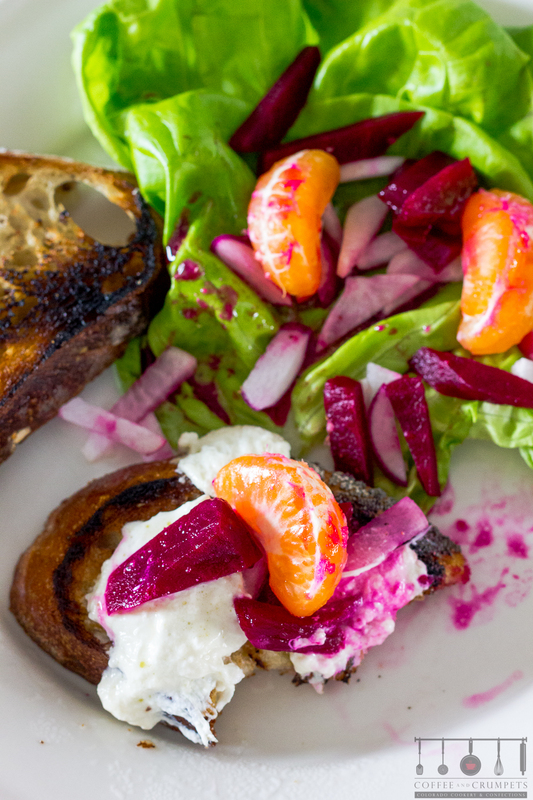 A pickled beet slaw using MM Local Holiday beets and seasonal satsumas served atop salmon and with a roasted burrata. In a medium size bowl, make the dressing. Add the beet juice from the jar and add the orange juice. Add 2 tablespoons of vinegar and if you'd like it more tart add the other tablespoon. Whisk in the mustard, if using. Use a mild mustard, like a honey mustard. A strong mustard will over power the delicate taste of the beet dressing. Add mite olive oil or vinegar to taste. In a dish large enough to hold the salmon fillets, place the fillets and pour over 4 tablespoons of the dressing to marinade the salmon. While the fish is marinating, make the beet slaw. Place the satsuma segments and the radishes into a bowl. Only add the beets if you don't mind everything being pink! I added the beets last so as to not colour everything. Start cooking the polenta according to package instructions. If you're using an instant kind, you might want to cook it while the fish is cooking so both will be hot when you serve. Heat a cast iron pan, or a skillet and add a drop of oil. Remove the fillets from the marinade and dry them off with a paper towel. I just seared and sautéed the fish on the cook top but if you don't like it too dark, you can finish off the cooking in the oven until it's cooked to your desired doneness. I like my salmon quite well done, but you can just keep an eye on the middle of the fish and cook to how you like it. 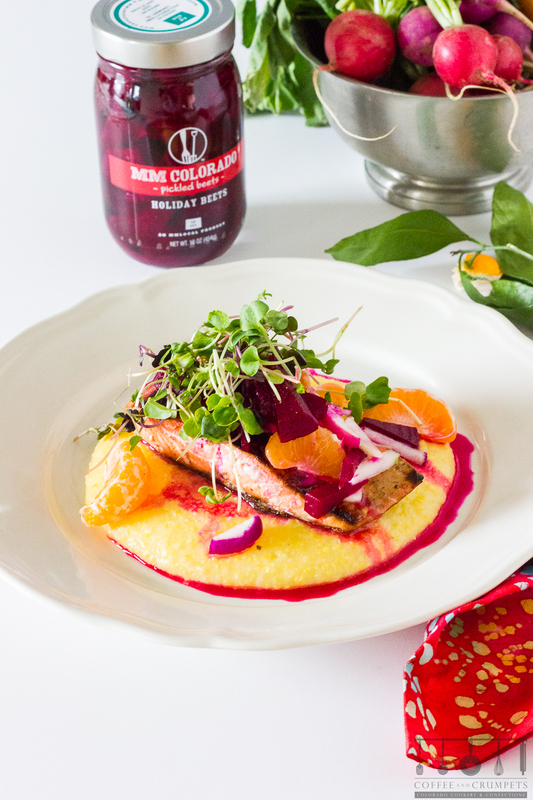 To plate, put a serving of polenta on a plate, top with a fillet of salmon. Add the beets to the satsuma and radish mixture. Place heaping spoonfuls on top of the salmon. Drizzle some dressing over the top of the beet slaw. Place a small bunch of microgreens or sprouts on top of the slaw. Place the burrata balls into a small cast iron skillet or a small baking dish. Place the dish in the oven. The cheese only takes 10 minutes to melt and bubble away. Grill or toast the bread slices. Have the beet slaw ready. Take out the skillet or baking dish from the oven, once the cheese is bubbling. Serve and eat right away while the cheese is hot and gooey. Spread on the grilled bread and top with the beet slaw. I’d like to thank MM Local Foods for giving me the opportunity to sample their products and for allowing me to create recipes for them. I had a great time eating and developing the recipes! If you haven’t tried them yet, please check out their website. They have some pretty cool gift packs for the foodie in your family. Wishing you all a very happy and productive week ahead! NOTE: I’m having a heck of a time getting my posts to not go in the spam folders of my readers. Even my own posts are going into my spam folders, especially for GMAIL. I have tested my outgoing mail server and everything, it all checks out but still, every now and then, they end up in spam. PLEASE, lovely readers, if you could just add my address to your contacts, then you should get them with no problem….I hope. I have also noticed that I have lost a lot of subscriptions from my blog friends. I have gone back and subscribed, but some are still not working. I have let you know, but they don’t end up in my spam folder, they just don’t show up. Thank goodness for other social media, which is how I find out about new posts. Must be something out there to make life more difficult for us. Disclaimer: I was provided with product samples from MM Local Foods. All recipes and opinions are my own and I was not compensated in any way. Slaw looks delicious..a great side dish! CONGRATS Nazneen on making it onto the cover of their opening album on FB! I love beets in every form – though I haven’t tried it with cheese. Your slaw is so colorful and sounds delicious – now, I hope you post that creamy chicken stew too! Nice photo, Nazneen! And wow, this beetslaw is just a complete meal for me, plus cream cheese! Mmmm!! Oh the colors! So gorgeous! Mary Frances recently posted..MARY’s secret ingredients Giveaway Winners announced! 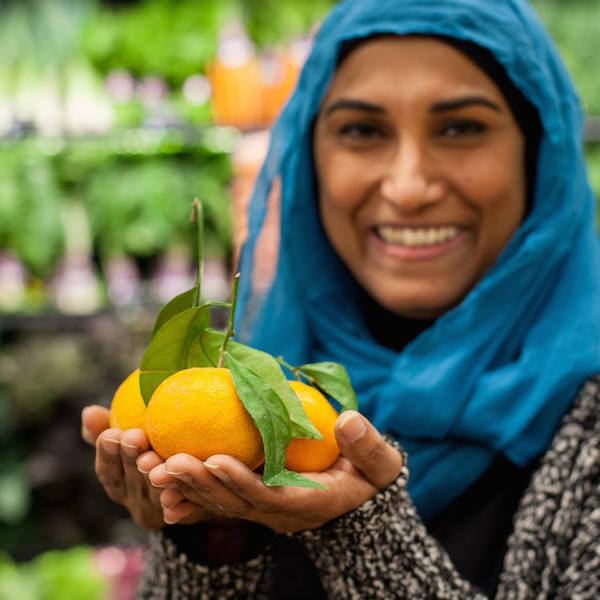 What a fantastic photo of you…you outshine those lovely oranges. 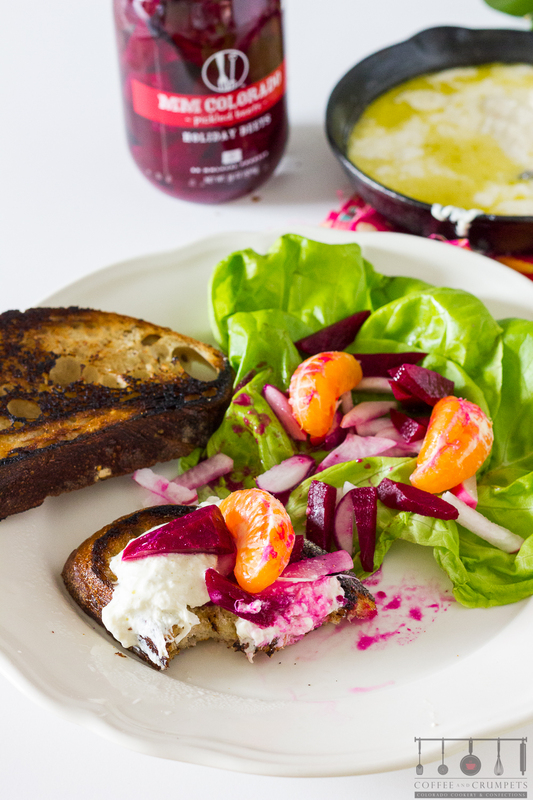 You certainly have come up with the perfect way to use your pickled beets. 🙂 BTW, I’ve been having lots of problems too…something strange is happening in blogland. Look at the colors of the second photo!! stunning and beautiful. My husband loves beets in all sorts and kinds, will definitely look for this brand around and give it a try. I would like a plate of the creamy chicken please :). I could eat the polenta by itself because I am craaaaazy for creamy polenta. Although I am not a fan of pickle veggies, this dish looks gorgeous, fresh, and quite appetizing. Hi Nazneen. Even though I pickle beets every single year and have a stock pile in my garage, I for some reason have a jar of this brand of pickled beets that I’ve never opened. I must have wanted to compare them to my homemade. 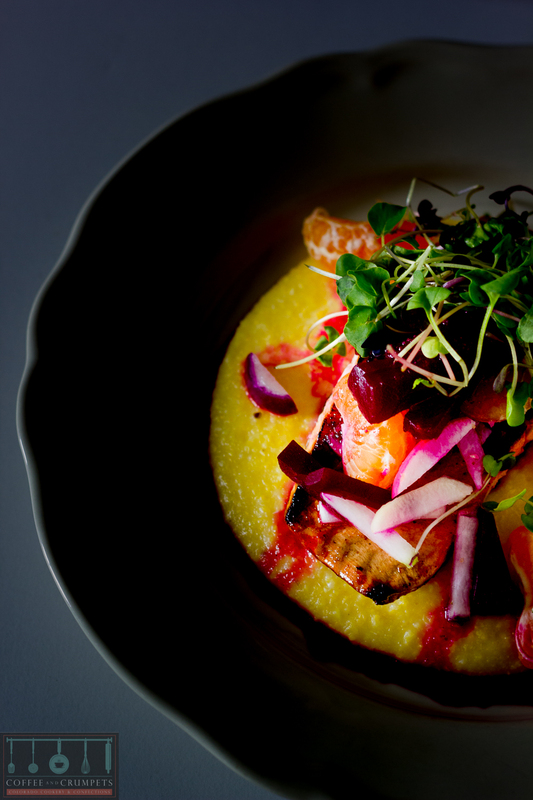 This dish is absolutely beautiful and a must try. I’m always looking for ways to use my beets other than alone in a bowl. I just made an avocado/beet combo that I’m going to blog about soon. I must say I was pretty pleased with my creation. And congrats on the Whole Foods incident. How fun is that???? I’ve never seen a warm burrata before but my imagination went in all sorts of directions when I read that – sounds fantastic. It suddenly got cold here too – we were mid=teens a couple of weeks ago and now it’s 5C. No sign of snow yet thankfully. I love your smile Nazneen. Stay smiling and keep the delicious posts coming. The pickled beet slaw sounds yummy! What a gorgeous dish! I love that top photo — very striking. And I love beets in any form. Great recipe — thanks. I love all of them..beautiful plating and serving ideas. The one with polenta looks the best!